A juvenile great white shark washed up on Sydney’s popular Manly Beach on September 11, and was taken to a sea pool after it was found too weak to swim out to sea. Rob Townsend, life sciences manager at Manly Sea Life Sanctuary, said rescuers took the baby shark to Fairy Bower Pool in a stretcher after initial efforts to push it back out to sea were unsuccessful. “A few people on the beach tried to push it back out to sea, but it washed up four or five times,” Townsend told Nine News. 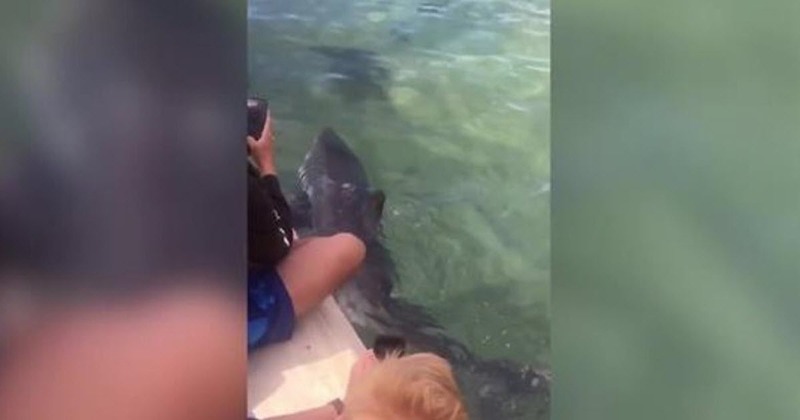 “It’s still in a very weak state and has suffered some superficial injuries.” The shark was expected to stay at the pool for the afternoon and could be released into the sea later in the day. This video shows the shark swimming at the Fairy Bower Sea Pool, which is a rock pool for the swimmers. Trained professionals from the Manly Sea Life Sanctuary stepped in and used a sling to move the animal to the nearby Fairy Bower Pool and then later transported the shark to the sanctuary. This Dog Was Raised By This Hardened Prison Inmate. Their Goodbye Will Break Your Heart.